Harbor of Refuge Breakwater Light is the third lighthouse to be built on this site. In 1825 Congress authorized construction of a breakwater at Lewes to meet the demands for a place where ships could seek shelter behind Cape Henlopen, Delaware. The Harbor of Refuge Lighthouse sits at the end of a breakwater on the ocean side of Cape Henlopen. It marks the entrance to Delaware Bay. The first light was a temporary white frame tower structure built in 1902 with a 5-day lens lantern. 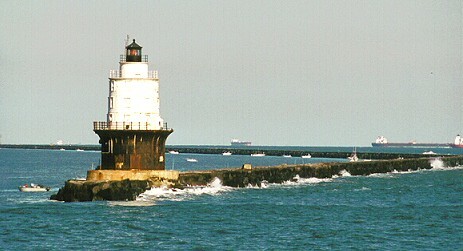 In 1908 a permanent lighthouse that was a white, hexagonal, three-story, frame structure, with lead colored trim and a black lantern atop a brown, cylindrical, iron foundation was built. The light had a fourth order Fresnel lens and a compressed-air siren for the foghorn. After a series of storms from 1918 into the early 1920s, the tower was no longer inhabitable. The US Lighthouse Service had the structure demolished. In 1926 a white, conical, metal tower lighthouse topped by a black lantern was constructed. The superstructure rests on a black, trumpet shaped, iron caisson built into the breakwater. The pier was lined inside with reinforced concrete and the tower with brick. The whole structure was supported upon a heavy block of concrete lying within the breakwater. The light had a fourth order Fresnel lens. The lens revolved on ball bearings and was driven by a clockwork mechanism activated by weights within a hollow central iron column. The current light is now a Vega VRB-25 operated by solar power. This lighthouse now stands as the only active light at Cape Henlopen as the Delaware Breakwater Light was deactivated in 1996. In April 2002, the United States Coast Guard leased Harbor of Refuge Breakwater Light to the Delaware River and Bay Lighthouse Foundation, Inc. The group plans to restore the lighthouse and to eventually make it accessible for educational tours to the general public. The lighthouse is not open to the public. The lighthouse is visible from the Cape May-Lewes Ferry and from Cape Henlopen State Park in Lewes, Delaware. Proceed 7.0 mi. on Rte 50 to Rte. 404 Turn left on Rte. 404 E. (approximately 30 mi. later, Rte. 404 divides into "business" and "bypass". Take the "bypass" but either one will do.) Rte. 9 joins Rte. 404 at Georgetown. At this point, follow Rte. 9 E.